I received a great question from a reader asking for specific directions to set the categories in a Zazzle store using images rather than text. The following steps will explain how to do this. Using images is a great way for your customers to find their favorite design on all the products you offer. 2. You will now be on the ‘Choose Your Content’ page (Ill. 2). 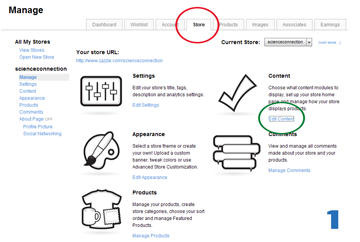 Check the boxes as I have done, with special attention to ‘Change store display options’ circled in red. Choose ‘Full grid’ which will allow you to show an image as a category. 3. Next go to your product page (Ill. 3). Choose ‘Add new category’ (circled in red). The ‘Add new category’ box now pops up (Ill. 4). Click ‘Change’ (circled in red) and you will be prompted to choose an image, either from your uploaded images or from images on your computer. Fill in the ‘Category name’ box as well as the ‘Description box’ and click ‘Done’. Your image will show up on your home page with the category name appearing in your sidebar. To insure an appealing and orderly look on your home page, be sure to use images for your image categories that are the same size and shape. I suggest cropping your images into a square shape of 5×5″ at a resolution of 72 before uploading. Repeat this process for each image you wish to represent a category on your home page. I hope my readers find this article clear and easy to understand. I am always happy to answer questions and look forward to any and all feedback. The Front page of your shop should include at least a header, profile link and categories/products. 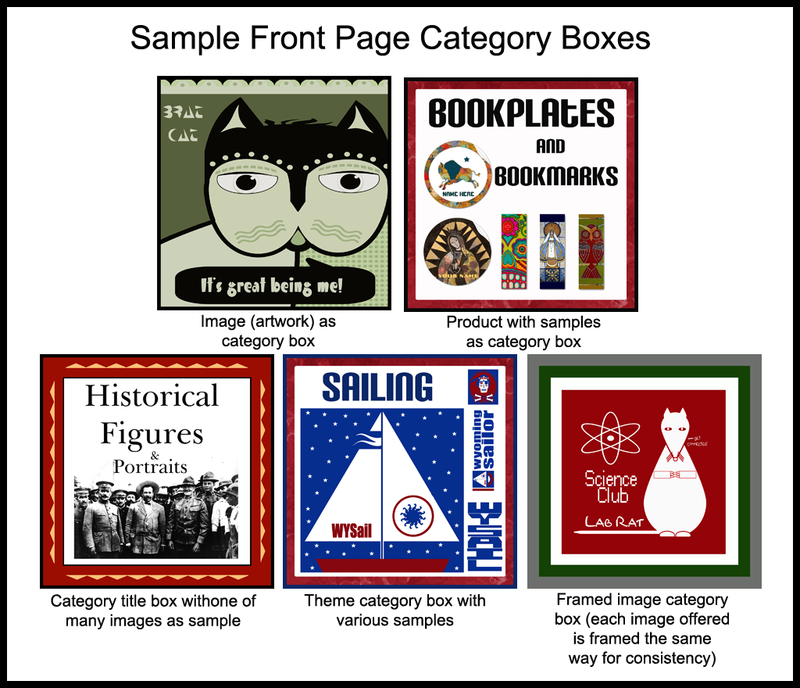 This article addresses ways to set up and organize your product/image categories creatively and how to best showcase what you will be selling. In my personal experience, using the IMAGE as a category is the most effective way to showcase the professional artist or photographer because the front page becomes your portfolio. This method is also effective (as in the case of Science Connection above) if you have few, but distinct, images available. Choosing to display no categories gives a blog-like feel to your front page, like in the case of Jeremy Bonifiglio above, who has a background in photo journalism. Especially good for a large store with many images is the PRODUCT as category option. One’s customer can always use your store’s search to find specific types of images. Browsing is encouraged here and relies on the storekeeper’s ability to keep the interest of the potential customer. The passionate enthusiast looking for very specific artwork will like your SPECIALTY category set up. These shops reflect the shopkeepers devotion to something in particular, music in the case of Old Rocker Dude, and followers are usually very loyal to your shop. Use the NO CATEGORY option if your store only sells one type of product such as speakers only as in the case of Hear Me Now Speaker shop. Product designs are showcased effectively in this way. 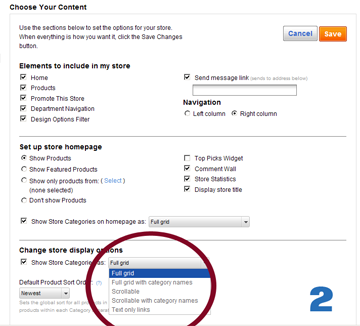 Once you have made a decision about how you wish to use categories on your front page go to MY ACCOUNT and click on PRODUCTS (you will see ‘dashboard’, ‘account’, ‘store’ and then ‘products’). Near the top of the page you will see the page name, Categories, and underneath you will see ‘add new category’. Click this option and you will see the ‘add new category’ dialogue box where you can give your category a title and upload an image to change the picture from the gray folder to anything you wish. 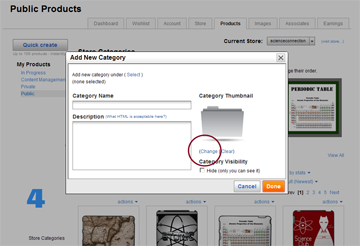 If you have opted to show no categories, click the hide button and only the products will show. To show products as categories you have the option of leaving the gray folder with the title of each folder identifying your categories or of designing a ‘box’ of your own design (most of the categories in Stuccoloco, are set up this way) using Photoshop, Corel or whatever you are using with which to edit photos and create designs. Using categories in an interesting and creative manner greatly enhances the appeal of your shop to potential customers and gives you a chance to express who you are. 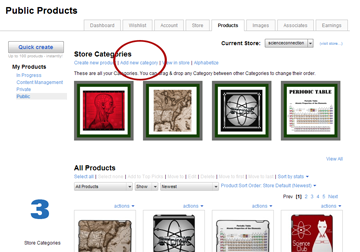 Browse some of the shops at Zazzle and you will find many people do not do much to individualize their storefronts. They are relying on their products being seen in the marketplace to make sales. This is fine, but having a nice, professional storefront that is memorable and easy to navigate will invite visitors to bookmark your site for future visits. This is obviously very beneficial over time. Keep in mind that you may revise your choices at any time, but making a few good decisions early and setting up your shop in an organized way will save time in the future, thus allowing you to do what you love most-sharing your art and designs on the products offered at Zazzle. As I mention in the post “Ten Things to Know BEFORE Opening a Shop on Zazzle”, I was not aware of all my options and I am revising and tweaking my store in my spare time. I hope some of the information I provide for my readers will help them avoid the time-consuming task of revision. Thank you for visiting and my very best to you and your future success on Zazzle.